To include a Yammer feed in a SharePoint page, your organization should have an active Yammer network (for example: http://www.yammer.com/contoso.com). For SharePoint Online, you can use the Yammer Highlights web part for a display of recent conversations, or the Yammer Conversations web part so that page viewers can engage in the conversation without leaving SharePoint. For SharePoint Server 2019 modern pages, you can use the Yammer web part to add a group, user, topic, or Yammer home feed. For SharePoint Servers 2013 and 2016 and for classic pages in SharePoint Server 2019, you can use Yammer Embed within a script editor web part to add a group feed, user feed, topic feed, Yammer home feed, or an open graph object feed that adds a discussion about an object such as web page. When you add a Yammer My Feed/Home feed to a SharePoint page, you'll see slightly different messages than the ones included in the home feed available in Yammer web, desktop, or mobile. On the SharePoint page, users will see messages from all threads in groups they are a member of and all threads in the All Company group. In Yammer web, desktop, and mobile, users can select Discovery, All, or Following feeds, but these aren't available in SharePoint pages. The My Feed/Home feed type is closest to the All feed, but doesn't include public posts in public groups the user doesn't belong to. Yammer does not have to be the social collaboration tool for SharePoint in order to embed a Yammer feed, but if you want to make Yammer the primary social experience for SharePoint, see Integrate Yammer with on-premises SharePoint environments. For instructions for how to use the Yammer Conversations or Yammer Highlights web part, see Use a Yammer web part in a SharePoint Online page. These web parts inherit the page theme, and are usable from mobile devices. The SharePoint Conversations web part is currently in Targeted Release, and may not yet be available for your organization. Go to Yammer in a browser, and go to the Yammer page you want to put in Sharepoint: a group, person, topic, or the Yammer home page. Copy the URL. In SharePoint, go to the page you want to put the Yammer feed on, and click Edit. Click + to add a new web part. Select the Yammer web part. In the Yammer box on the right, paste the URL you copied in step 1 into the Web address box. To change the display size, select an option in Display size. To publish your page, click Publish. Add a script editor web part to your SharePoint page. Copy and edit a simple script that identifies the type of feed you want and the Yammer network you are using. Paste the script into the web part and publish your SharePoint page. When a Yammer feed is added using this method, the feed can't be viewed when using a mobile browser or if third-party cookies aren't enabled. For more information about browser support when using a Yammer feed in a script editor web part, see Yammer Embed requirements. In your SharePoint site, choose Edit. On the ribbon, choose Insert > Web Part and in the Categories list, select Media and Content > Script Editor. In Add part to:, select where you want to add the web part, and then choose Add. Locate your new script editor web part, and choose Edit Snippet. Paste the script you copied from Yammer into the script editor web part. Save and publish the SharePoint page. You should see the Yammer Group conversation on the SharePoint page. The following procedures describe how to add a group feed, my feed, or page feed. For information about other feed types, see Yammer Embed. You can also use the Yammer Embed configuration tool to create the script to use. See Add the Yammer Embed widget to a SharePoint page for how to use the configuration tool. 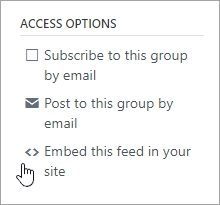 In Yammer, go to the group that you want to embed. Locate the Access Options section and select Embed this group in your site. Copy the script from the window. Edit the following script to use your Yammer network instead of contoso.com, and then paste it into the script editor web part. > You can also change the height and width parameters to the height and width you prefer. 1. Go to the page that you want to embed. Copy the URL to the page. 2. Edit the following script to use your Yammer network instead of contoso.com and to use the URL to the page that you want to discuss. You can also change the height and width parameters to the height and width you prefer. This example shows an open graph feed for a web page, but you can create feeds for other open-graph objects. The list of valid object types is at [Schema \> Supported Object Types](https://go.microsoft.com/fwlink/?LinkId=525586). If you are interested in using the Yammer Embed widget to add Yammer feeds to your SharePoint pages, see [Add the Yammer Embed widget to a SharePoint page](https://go.microsoft.com/fwlink/?LinkId=525587). Step 3: Paste the script in, and publish the SharePoint page. On the SharePoint page, paste in the script, and then click Publish.